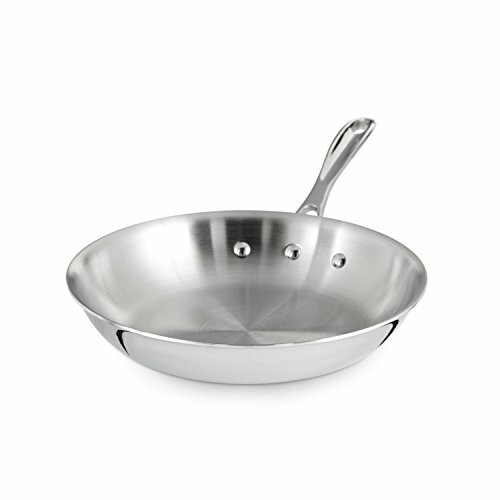 This is something I didn’t think was possible – making a PERFECT 2-egg omelet (omelette) in stainless steel cookware without it sticking. Every, single time I’ve tried in the past – the eggs stuck to the pan and well, I ended up eating scrambled eggs and having a messy pan to try and clean. So I came across this guy on YouTube who teaches bachelors how to cook. He’s really great – very clear, makes things simple to where even *I* can follow along, and he’s kinda funny, too. Best of all – this works like a charm! 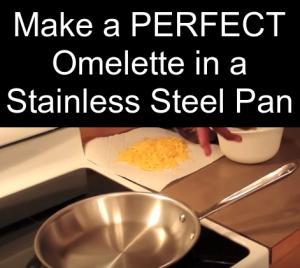 So here are some things I learned and the video I found showing how to make an omelet that does NOT stick in a stainless steel frying pan. Turn stove on to a little higher than medium low (or, a little less than medium). One of the biggest causes of food sticking in stainless steel cookware is due to cooking on temperatures that are too high. Let your eggs get to room temperature. Let your frying pan heat up completely and evenly for a few minutes – it’s ready when you can ‘flick’ some water in the pan and the water ‘dances’. Use just a little slab of butter AND let the butter heat properly. Most important, let the eggs cook on their own without touching them for a little bit. THEN, use your spatula to push the eggs back, tip the pan, and let the uncooked eggs get to the heat (you’ll see in the video). 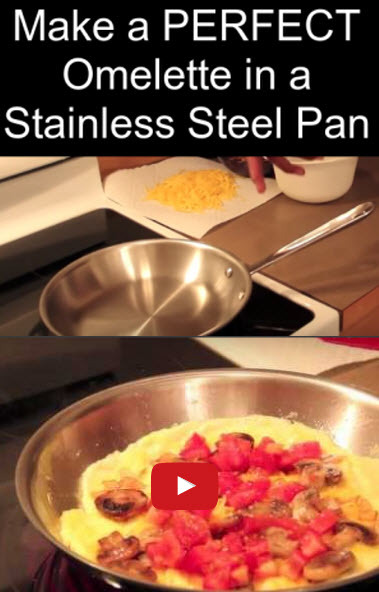 There are a LOT of stainless steel pots and pans on the market, but these pans seem to be the best for cooking omelettes.